A few weeks ago, I experienced the worst “that time of the month” symptoms I’ve ever had in my LIFE. It was horrible and left me in excruciating pain during the middle of the night. I’m convinced my hormones have been a little out of whack the past few months, and I’m assuming my stress levels / work load this month also contributed to my symptoms. Nonetheless, I resorted to rummaging through my cabinets the following night for some natural relief! 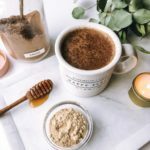 I made a yummy chocolate latte, or elixir if you will, with some of my favorite hormone-balancing ingredients. These included: cacao, ceylon cinnamon, maca, and ashwagandha. Cacao: cacao is rich in iron (it’s actually the highest source of plant-based iron out there!! Maximized benefits when paired with vitamin C), a great source of antioxidants that help fight free radicals in the body (40x that of blueberries! ), and is full of magnesium, the most deficient mineral in the world and calcium! It’s also completely sugar-free! I love adding a tbsp of raw, organic cacao in my smoothies every morning. Click here for my fav recipe on repeat!! 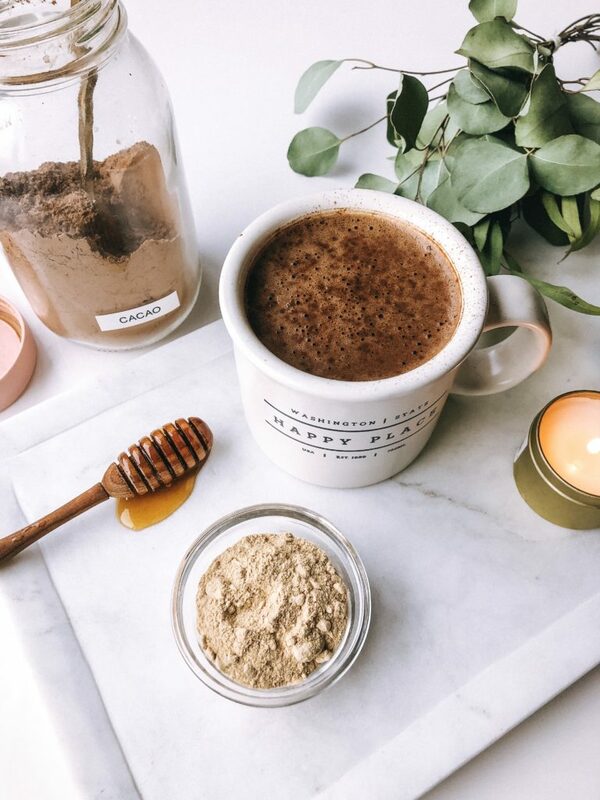 Ceylon Cinnamon: not only does high-quality cinnamon contain cinnamon acid, a powerful anti-inflammatory, it’s also a master antioxidant and has been shown to help regulate blood sugar (it’s true!). Click here for more info on the benefits of cinnamon. Maca: a root found in Peru and is an adrenal adaptogen, which helps your body better deal with stressors. It’s shown to improve mood, boost energy naturally, and is great for PMS & menopause symptoms. It has a very intense flavor, so start out small & make sure to follow recipes. Ashwagandha: another powerful anti-stress and adaptogenic herb, ashwagandha has tons of benefits. It’s been used in Ayurvedic medicine for years and has been shown to help resolve adrenal- and thyroid-hormone imbalances. It contains anti-inflammatory, antioxidant and hormone-balancing properties. I paired these ingredients with collagen (hello, healthy hair, skin, nails, & joints! ), and a sweet flavor + boost of immunity from my favorite Wedderspoon Manuka honey! A quick 2-minutes in the blender and woah. It’s GOOD. If you’re into peppermint, add a few drops of peppermint extract before blending and you basically have a hot minty cocoa! Recipe below– try it out! 🙂 p.s. if you have issues sleeping, I recommend having earlier in the evening due to the energetic effects of the maca & cacao. Boil water, then pour all ingredients in high-powered blender to blend on medium-high for 1-2 minutes. Sprinkle more cinnamon on top. Enjoy!! Just made this! Thank you so much. I didn’t have the right kind of cinnamon but researched it and will be getting some asap! I made this recently and it was so good! I used gelatin instead of collagen, it still came out great! 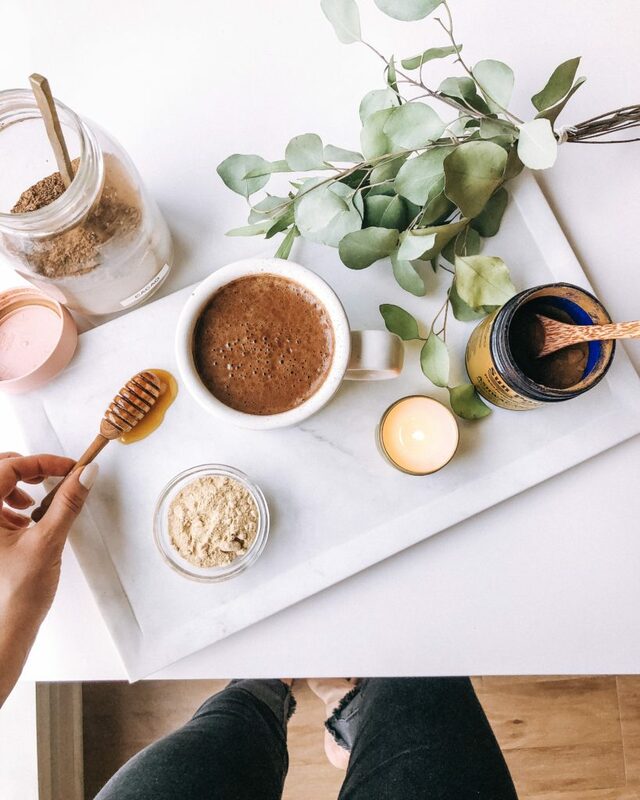 Do you have a brand of Maca you recommend? Love this recipe! Cannot wait to try it once I reintroduce cacao. I’ve been doing a ton of blood sugar balancing work so this will be the perfect treat!